Frightening Furnace Noises : What They Mean and When To Call A Pro - T.Webber Plumbing, Heating, Air & Electric. It may be the season for thrills and chills, but your furnace is one thing that definitely should not be going bump in the night. If you are hearing strange sounds coming from your basement or attic, a serious problem with your heating system could be to blame. Before you call in the reinforcements, here are a few of the most common frightening furnace noises and what could be causing them. If you hear a loud boom or bang coming from your furnace, you’re likely hearing a small gas explosion caused by a delayed ignition problem. This could occur as the result of clogged burners, dirty equipment, low gas pressure, not enough gas or a high air-to-gas ratio. Does your furnace make a rumbling noise when it finishes a cycle? There could be oil that is still burning in the combustion chamber after the burners are off. You may also have a problem with your pilot light, burners, blower motor or flame sensor. Popping or banging sounds may indicate that there is a problem with your ductwork. This problem most commonly occurs when there is a significant pressure difference between the return ducts and supply ducts. This pressure difference may cause the metal walls of the ducts to move in and out, resulting in the popping and banging sounds. If you are hearing the distinctive sound of metal against metal, your blower fan maybe coming loose. There could also be a screw or another small piece of metal that has found its way inside the blower wheel. In any case, turn off your furnace as soon as you hear this particular sound to avoid further damage. It may sound like a tormented soul, but screeching and squealing from your furnace often indicates that a motor belt has slipped off its track. You may also be dealing with dry shaft bearings or a broken blower motor. When you turn on your furnace, a clicking sound is normal. However, if the clicking continues and the blower turns on and off, you likely have a problem with your flame sensor. If frightening furnace sounds are keeping you up at night, call in the professionals. 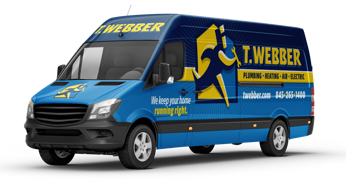 At T.Webber, we are equipped to handle any type of furnace problem, and we are here to help. Whether you’re in need of some routine furnace maintenance, you need to have your system repaired or your old furnace is due to be upgraded, our technicians provide high-quality work and will strive to exceed your expectations. To schedule an appointment, please contact us today. Call 845-288-2777.